Upside (Drawdown) - The Potential of Restorative Grazing to Mitigate Global Warming by Increasing Carbon Capture on Grasslands | Planet-TECH Associates: Trends. Innovations. Opportunities. Planet-TECH Associates is today releasing a draft / review copy of a white paper on the potential of a restorative grazing practice called Holistic Planned Grazing (HPG) to enhance carbon capture on grasslands. The paper suggests that the global potential carbon drawdown may be quite larger than previously estimated, where restorative grazing had not been factored. It is suggested that 25 to 60 ton of carbon per hectare (t C/ha) may be sequestered on semi-arid grasslands and savannas, representing a transition from highly degraded to fully restored landscapes. The global potential is estimated to be in the range of 88 to 210 gigatons (Gt), with a CO2 equivalence of approximately 41 to 99 ppm, enough to significantly mitigate global warming. The introduction and first-part conclusions are provided herein. The full paper including citations is available at the bottom of this page and at the link below. Comments should be sent to seth@planet-tech.com. The global warming crisis is forcing consideration of innovative and alternative approaches to climate mitigation and reversal. Simply going to a zero fossil fuel economy will not stop catastrophic consequences, even if such an about-face in energy use were achievable. At our current level of 400 ppm atmospheric CO2, we are already well beyond what has been deemed the maximum safe level for human habitation, 350 ppm (Hansen, 2008). Indeed, recent anomalous weather and warming related events, including the unexpectedly rapid loss of arctic sea ice (Maslowski, 2012), may indicate that “amplifying feedbacks” are already underway (Glikson, 2013; Torn & Harte, 2006). This situation, unfortunately, is not likely to be remedied with a simple return to 350 ppm. Doing so may only slow warming to the rate it was at in 1988, when it was last at 350 ppm, and evidence of impact was already alarming (Hansen, 1988; Shabecoff, 1988). In fact, warming will likely be worse in a future 350 ppm scenario, because the cumulative impacts will have weakened the planet’s potential to absorb excess heat. There is probably no actual reversal of warming until CO2 concentrations are brought back to preindustrial levels, well under 300 ppm. To accomplish this essential and herculean task requires not only cessation of fossil fuel emissions, but also a drawdown of approximately 200 gigatons carbon (200 Gt C) from the atmosphere. It is clear that the only conceivable safe and long-term solution for this is through global ecosystem restoration. This will include forests and wetlands, but particularly, also, grasslands, including prairies and savannas, where carbon is sequestered through the roots of perennial plants and bound in organic soil compounds for decades to millennia (Rabbi, 2013). In total, grasslands comprise the largest ecosystem on Earth and are major stores of terrestrial carbon. By various estimates, they cover between 26% and 40% of the world’s land while containing 20% to 35% of soil carbon (FAO, 2010; Ramankutty, Evan, Monfreda, & Foley, 2008; R. White, Murray, & Rohweder, 2000). Even small percentage increases in soil carbon worldwide can dramatically reduce atmospheric CO2 concentrations. Entering this conversation is the practice of Holistic Planned Grazing (HPG), in which livestock are herded in a fashion that replicates the beneficial grazing, trampling, dunging, and nutrient recycling dynamics with which wild herding ruminants coevolved with perennial grassland plants and carbon-rich soils (Savory & Butterfield, 1999). Decades of anecdotal evidence and recent studies suggest this practice has great promise, both for ecological functioning, including plant growth and hydrology, and for increasing soil organic carbon (SOC) (Dagget, 2005; Earl & Jones, 1996; Gill, 2009; Howell, 2009; Norton, 1998; Stinner, Stinner, & Martsolf, 1997; Teague et al., 2011; K. T. Weber & Gokhale, 2011). For example, Teague (2011) showed that land managed under a restorative grazing regimen (multi-paddock with ecological goals) had a far higher SOC value than land on a similar site managed with traditional (heavy continuous) grazing. When factoring across all soil profile depths measured, this added carbon equated to a 30 t C/ha. Additionally, Weber (2011) showed that land under a restorative grazing regimen (simulated Holistic Planned Grazing, SHGP), had significantly improved water holding capacity, measured as percent volumetric-water content, %VWC, when compared with traditionally grazed lands. Hydrological functioning is correlated with soil carbon (Feger & Hawtree, 2013; Franzluebbers, 2002). In the absence to date, however, of robust HPG carbon data, this paper infers soil-carbon sequestration potential, based on known SOC values for representative biomes (DOE, 1999; FAO, 2009; Hiederer & Kochy, 2011; Lal, 2004b; UNEP, 2009; R. White et al., 2000; W. White, Wills, & Loecke, 2013), and, in light of this innovative approach to grasslands restoration, reevaluates current estimates on soil C losses and sinks (Lal, 1999, 2004b, 2011). The investigation shows that grassland carbon capture may be far greater, and more rapid, than what has previously been considered possible, where restoration via enhanced ruminant impact had not been factored. 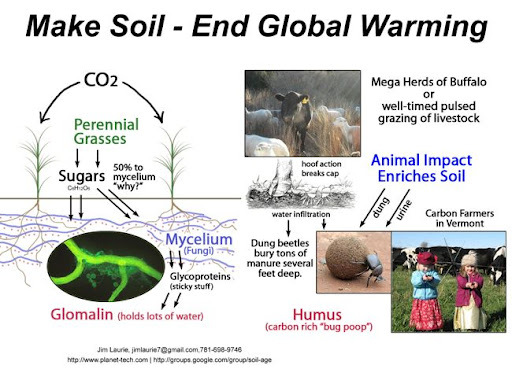 Managing livestock in this entirely new way, not just as consumers of grass, but also as essential elements in ecosystem balance, and with restorative goals as an intention, enables significant upward estimation of soil-carbon sequestration potential. Although there are many uncertainties, and future research is needed, these considerations broaden the narrative on climate change mitigation. HPG May Sequester 25 to 60 t C/ha in Semi-arid Grasslands - Semi-arid grasslands under HPG may sequester between 25 to 60 t C/ha, demonstrating a shift from semi-desert, shrub land to healthy tropical savanna and perennial grassland. This range is inferred through comparisons with visual assessments of land improved through HPG with SOC density values for similar land in corresponding regions, using a wide range of sources (DOE, 1999; FAO, 2009; Hiederer & Kochy, 2011; Lal, 2004b; UNEP, 2009; R. White et al., 2000; W. White et al., 2013). This transformation represents an inferred increase in SOC of approximately 60 t C/ha, or from a 40 t C/ha to a 100 t C/ha profile. This transformation may be obtained in 25 years, giving an average carbon capture rate of 1 to 2.4 t C/ha/yr. The maximum carbon capture rate may be reached in about the tenth year (Akala & Lal, 2000). Total Soil Sink Potential for Grasslands may be 88 to 210 Gt with a CO2 Equivalence of Approximately 41 to 99 ppm - Assuming that the sequestration potential in semi-arid grasslands will be less than that on temperate prairie, we can infer the former potential to be a minimum, and thus the basis for a conservative estimate. Where there are 3.5 Bha of grasslands (FAO, 2010), all of which is postulated herein to be severely depleted from their antecedent SOC pools (Buringh, 1984), either through cultivation (Lal, 1999) or through sedentarization resulting from the loss of native ruminant impact (Savory & Butterfield, 1999; K. Weber & Horst, 2011) this paper calculates that the potential for SOC sequestration on grasslands is 88 to 210 Gt. This is the atmospheric CO2 reduction equivalency of 41 to 99 ppm, enough to dramatically mitigate global warming. Using data from numerous sources for SOC density by biome (DOE, 1999; FAO, 2009; Hiederer & Kochy, 2011; UNEP, 2009; R. White et al., 2000; W. White et al., 2013), and for SOC loss from cultivation (Lal, 1999), this paper finds that a variation in SOC density of approximately 25 to 60 t C/ha represents a dramatic and visible transition in ecosystem health and classification (see Tables 1 through 2 and Figures 4 through 7). For example, visual mapping of SOC densities from Hiederer and Kochy (2011) show extreme desert regions of the world with SOC in the range of 0 to 25 t C/ha; dry, semi-desert, shrub-land and savanna regions of the world, such as much of the US southwest, Australia and sub-Suhara and southern Africa in the range of 25 to 50 t C/ha; agriculturally healthy and productive regions of the world, such as large swaths of eastern and central United States, southern and central Africa, the majority of India, and coastal Australia in the range of 50 to 75 t C/ha; and prime prairie and forest land such as large parts of Brazil, central US and southwestern Canada, in the range of 75 to 100 t C/ha. Highly forested and jungle regions are in the range of 100 to 200 t C/ha, and wetlands and peat-lands are at the upper extremes with SOC densities in excess of 200 t C/ha. W. White et al. (2013) shows that the arid US Southwest and Great Basin regions are in the range of 52 to 64 t C/ha, whereas most of Texas, Oklahoma and the Dakotas are in the range of 111 to 132 t C/ha. Statistical data from DOE (1999) state the SOC density for extreme deserts is 26 t C/ha; for desert and semi-desert, shrub land: 83 t C/ha; and for tropical savanna: 146 t C/ha. The DOE data also shows that cultivated and permanent cropland is 81 t C/ha, practically identical with tropical savanna. Lal (2004b) provides values for SOC on “desert and semi-desert”, and “tropical grasslands and savannas” as 42 and 117 t C/ha respectively. Lal (1999) also shows that the value for cropland, 103 t C/ha, is almost identical to that of tropical grasslands and savanna. Hiederer and Kochy (2011) choose 25 t C/ha as the range for delineation on most of the world’s surface. Given general knowledge of world geography, when viewing their maps, this seems appropriate. On a global scale, a finer presentation would appear unwarranted and a wider one, too coarse. W. White et al. (2013) have a similar delineation between many of the visually designated SOC regions in the lower 48 states in the United States. Certainly there is a continuum, where land changes are notable as they transform from one biome classification to another, either naturally through changes of geography and precipitation, or artificially through human intervention. The land transformation that seems most germane in this assessment is that from semi-desert and shrub land to healthy savanna, tropical grassland and cropland. Inferring from the visual data provided from Hiederer and Kochy (2011), this would clearly be visible given a land change of 50 t C/ha. Using classification from DOE (1999), the transition from semi-desert to tropical savanna is 63 t C/ha and from Lal (2004b), the transition from semi-desert to cropland is 61 t C/ha. Thus, the many fence-line and before-and-after pictures demonstrating land restoration through HPG (photos included) indicate an increase of SOC in this range (25 to 60 t C/ha). This delta in SOC density is also consistent with Lal’s thesis that a “new equilibrium” for land types will be obtained after a loss of 20 to 50 t C/ha (Lal, 1999). This paper assumes the opposite is also true. That is, a new equilibrium will be obtained through an increase of 20 to 50 t C/ha, moving from a depleted state toward a restored one, gaining through restoration, instead of losing through cultivation. These inferred changes have been realized on land under long-term HPG (25 to 30 years) and thus represent yearly sequestration rates slightly greater than, but not outside the range of, other sequestration demonstrations on similar land (Table 5). The improvement is attributed to the proper management of the ruminants that are providing beneficial grazing services to the land, while avoiding the overgrazing and “over rest” of convention. In some cases, dramatic land restoration is realized in only a matter of years. In such examples, it is because the livestock were tightly corralled on the site for seven to ten days, and thus intensive manuring occurred. On this basis, this paper finds that the restoration potential on depleted grasslands and savannas, using proper management of livestock as a tool, may be quite larger than Lal (1999, 2004a) has previously estimated. If such restoration, on the order of 25 to 60 t C/ha, were achieved over the entire grasslands biome, estimated at approximately 3500 Mha (FAO, 2010), the carbon drawdown would be 88 to 210 Gt C. This represents the atmospheric CO2 reduction equivalency of 41 to 99 ppm, enough to dramatically mitigate global warming.